At Hilo Seaside Hotel, enjoy a satisfying meal at the restaurant. Quench your thirst with your favorite drink at the bar/lounge. Breakfast is available daily for a fee. Daily Resort Charge will be added to the room rate and includes: Guest internet access; parking; Big Island Breeze daily beverage for 2; snorkel rental for 2; 9-hole executive golf course with clubs & cart, 3 rounds daily for 2; 20% off evening volcano explorer tour; local and toll-free calls.Boasting a stunning oceanside location with magnificent views of Hilo Bay and Mauna Kea, Grand Naniloa Hotel Hilo - a DoubleTree by Hilton Hotel occupies a historic site amidst a lush, tropical landscape. Our ideal setting also offers guests convenient access to Hilo Airport, just 2 miles away. Tee off on our 9-hole golf course, or soak up the sunshine in our beautiful outdoor swimming pool. Energize in the complimentary fitness center, or hire some water sports equipment and take to the waves.Our inviting guest rooms offer complimentary WiFi, a generously-sized work desk, a microwave, refrigerator, and in-room safe. Upgrade to an ocean-view suite with a separate living area and a balcony offering memorable ocean views. Savor breakfast, lunch and dinner in our restaurant, which has indoor and outdoor seating. Admire sweeping vistas of Hilo Bay from the large deck of our Lobby Lounge.Our Hilo hotel features the most extensive catering facility and the largest showroom on the east side of the Big Island – a stylish venue providing nightlife and a space to showcase talented local musicians. With 20,000 sq. 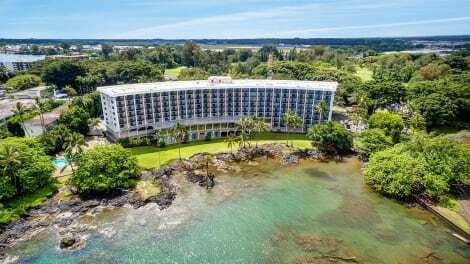 ft. flexible meeting space, including a wedding gazebo and a large ballroom which can hold up to 400 people, this Hilo hotel is the ideal venue for small to mid-sized meetings, conferences and weddings. Take advantage of onsite catering and the latest A/V technology, and stay productive in the 24-hour business center.Our friendly, professional staff look forward to welcoming you with a signature chocolate chip cookie upon check-in. lastminute.com has a fantastic range of hotels in Hilo, with everything from cheap hotels to luxurious five star accommodation available. 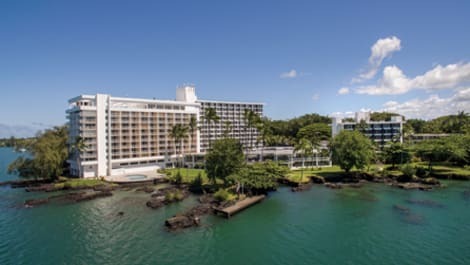 We like to live up to our last minute name so remember you can book any one of our excellent Hilo hotels up until midnight and stay the same night.